Home » News » Star Wars Launch Bay And Much More Coming Soon! In addition to the big announcement about a total Star Wars Expansion at Disney's Hollywood Studios, there was some more exciting galactic news about what will be coming up in the next year to further incorporate the Star Wars Universe into the bi-coastal Disney Parks. Walt Disney World will get a number of these Star War enhancements for guests to enjoy while waiting for the new land to open. First Star Wars Launch Bay will be a new preview center set to open in located in the Animation Courtyard at Disney's Hollywood Studios. It will feature sets and special exhibits with peeks behind-the-scenes, of the upcoming film Star Wars: The Force Awakens. 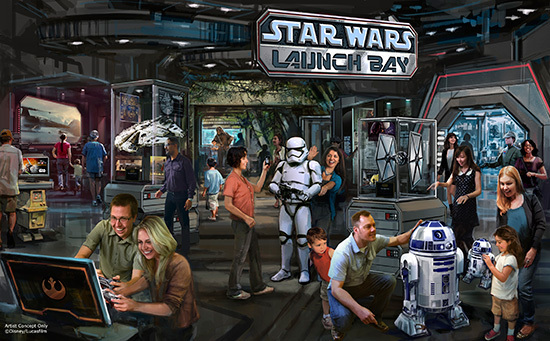 Activities at the Launch Bay will include opportunities to visit with Star Wars characters, special merchandise and even food offerings. At Star Tours - The Adventures Continue guests will get to take off on another new adventure! The new galactic travel destination will give even more possible combinations to the randomized ride sequence including locations and characters from the upcoming film, Star Wars: The Force Awakens. A favorite with the younger set, Jedi Training Academy will be getting a make-over to include new characters and even a new villain to battle, straight from the popular Disney XD series, "Star Wars Rebels." Finally Season of the Force, will be an "all new seasonal event" at Walt Disney World beginning early 2016 at Disney's Hollywood Studios. Guests will get to close down weekend nights with a brand new fireworks spectacular set to the iconic score of the Star Wars movies.